What? You mean you didn't know that Penn and Teller have been on Broadway before? Well they have. However it has been over twenty-five year's since these world famous illusionists have performed on the Great White Way. Now believe it or not, but I am a huge Penn and Teller fan. In fact, one of the very first VHS cassettes that I purchased as a kid, was Penn and Teller's Cruel Tricks for Dear Friends. A VHS cassette? Yes I know. I'm aging myself aren't I? I swear I must have watched that tape over a hundred times. Like I said. I'm a fan. Previews for their latest show are set to begin at the Marquis Theatre on July 7 and play thru August 16. Now for those of you who know nothing about Penn and Teller you are in for a treat my friends. They are truly the best at what they do. Which is why you need to see them. Of course I'm guessing you might want a little information on them first right? After all you're the one that is purchasing the tickets. So let's get to it. Here is a little synopsis of the show to wet your appetite. Enjoy! PENN & TELLER seem to be everywhere: Celebrity Apprentice, Dancing with the Stars, world tours, Las Vegas! Now, the evil geniuses return to the place that helped launch their careers. Broadway! For the first time in almost 25 years, the duo comes home, where they will bring astonishing tricks from their record-breaking Vegas act, along with their most outrageous classics, to the Marquis Theatre. Throughout their eclectic and indefinable careers, the duo has stabbed and shot at each other, been run over by tractor trailers, and caught bullets in their mouths. Now, for 6 weeks only, PENN & TELLER promise to shock and amaze Broadway like never before, and keep it all family friendly…for really demented families. Sounds like fun to me. I know. Big surprise right? The only question is how do you get tickets? Well it's easier than you might think. Just give us a call and we can get tickets for you. See? I told you it was easy. 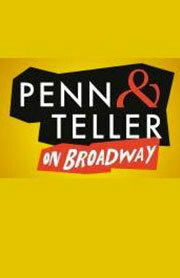 Get your tickets to see Penn and Teller on Broadway at the Marquis Theatre. Who knows? Maybe I'll see you there. Until next time magic fans.